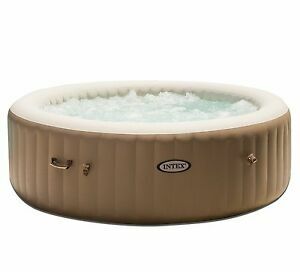 This Intex Pure Spa Inflatable Hot Tub blows up to accommodate up to 6 people comfortably. Setup is quick and the temperature reaches 104F just 14 hours after set up. This particular unit also features jets and heated bubble dispensers that keep the water warmer longer. Fantastic Seller, recommend to ALL, Thank you! It arrived quick but the rain is holding me back from setting it up. Can’t wait. A very good product, especially for the price! I've had the hot tub for about two weeks. It was shipped very quickly. It was easy to assemble. My wife and daughters are very happy with it. I have no complaints. I would recommend this product to anyone. It is very well worth the money. Made of very tough material. I believe most people would be very happy with this product. However, you cannot please everybody. Noise of this hot tub is unbearable and ridiculous. I have no idea what they were thinking using such loud vacuum cleaner style pump in it. Just stupid. Also look at amazon reviews for this product, eBay reviews are probably fake. I fell a victim of that. Wasted time now. Tub is going back. Here is a video, if you are curious what I call ridiculous: youtu.be/ZIlU7Lb-Coo hope this helps! Didn't take long to set up. We have been using it for about a month. Electric bill is up approx. $50. We leave it on 24 hrs. Only use bubbles when we actually use it. Temp is set at 99 deg and we are very comfortable with that temp, not too hot and not too cold. It will drop 1-2 deg when we use it. Wish we could keep it up all winter. But our northern IL winters are too cold. Make sure to use chemicals and monitor on a regular basis. Great value and my family loves it! Good quality product. Shipping was fast. Setup was easy. Had this for 2 weeks now and use it every night. Me , my wife and daughter fit in it comfortably with lots of room. I am 6'2 235 and can stretch out in it. We love it. It does take a while to heat but once its heated its nice probaly heats 2 degrees an hour. We get in its 104 we are in there for about 1/2 hour it drops to 101.. would recommend. We are renters so this is perfect for us. We built a deck around ours to hold drinks and put plants around it. Bubbles are powerful and feel great on your back and neck. If your looking for a hot tub but dont want to spend thousands on a hard shell one this is perfect alternative. Good bang for your buck!!! This product was very easy to set up. Well constructed and came with everything you need to get started. Perfect for the first time hot tub owner who’s not sure they will use it enough to spend thousands of dollars. Set it up in the basement.